Background The formulation of a research question is a vital first step in the research process and the significance of this is well reported in the literature; a well-structured question increases the outcome of useable findings. To aid the development of a research question, a number of frameworks in the form of mnemonics have been identified. It is suggested that the application of these mnemonics may result in confusion rather than provide helpful guidance. Aim To present an overview of some of the mnemonically identified frameworks and consider how they may support the development of a research question. Discussion The use of mnemonics can help to develop questions for empirical research or to identify published evidence. The oldest and most commonly cited mnemonic is PICO, which is most often discussed in association with quantitative approaches. Other mnemonics share similarities with PICO, although may be more aligned to particular research approaches. Along with a flexible approach to their use, the characteristics required to establish an effective research question may support the application of published mnemonics. 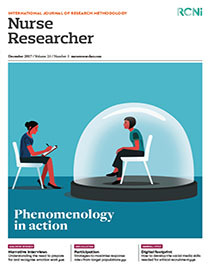 Conclusion The availability of frameworks in the form of mnemonics can help in the development of a research question, but their use and limitations must be fully understood. A flexible approach to their use is vital and this may also be helped by considering the characteristics of an effective research question. Implications for practice When developing research questions, nurse researchers and nurses with a role in academic supervision should use the available mnemonics as a guide rather than rigidly adhering to them. They should also be aware of the characteristics of a good research question and advise students accordingly. Share article: How helpful are mnemonics in the development of a research question?